The Pure Relief company is a pioneer in the CBD industry. The company has offered a diverse line of products since long before the rest of the world started going crazy for CBD. Providing high-quality products like CBD edibles, oils, capsules, and products for pets, the company aims to meet their customers varied needs. The thoughtfully crafted CBD oil is pharmacist-formulated, all-natural, and made from hemp grown in the United States. Pure Relief’s mission is to offer solutions to life’s challenges, whether it’s relief from chronic nerve pain or helping an aging pet. 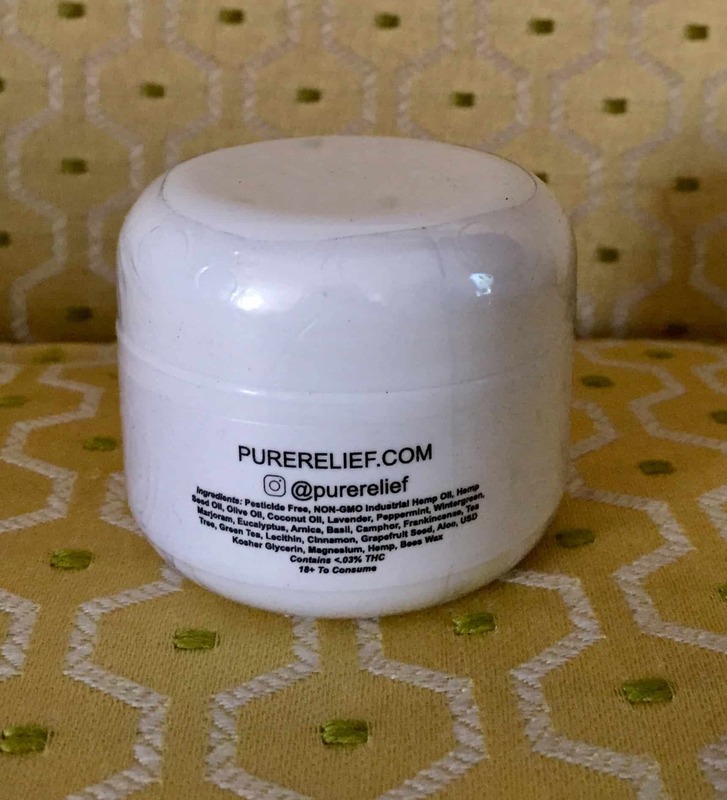 Pure Relief makes a CBD-infused salve perfect for easing muscle and nerve pain. The all-natural salve contains 500 mg of high quality, lab tested CBD. This topical is filled with essential oils to calm the mind and cooling agents like camphor for pain. There is also arnica, a homeopathic remedy has been used in my household for a long time to help with muscle strain or bruising. I found arnica particularly helpful when dealing with post-surgical complications. My chronic pain is bad so I decided to start physical therapy. The nerve pain feels like someone stabbed a flaming sword into my back that comes out the other side before setting fire to everything below the belly-button and above the knee. I was incredibly nervous about starting. I mean, I’ve wanted to be in physical therapy forever, but it took a long time to get a diagnosis. 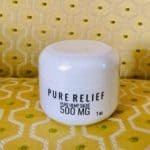 I probably won’t ever not be in pain, so topicals like Pure Relief’s salve have become a daily part of my ongoing quest for relief. While I was nervous about the pain I would surely experience just getting in the car to go to physical therapy, I knew I had to do it to get better. To prepare, I took my doctor-prescribed medicines of baclofen and gabapentin then rubbed on a healthy amount of the Pure Relief hemp salve. The suggested use is a “pea-sized amount on the finger” but I used as much as I needed, massaging it into the painful areas. Then I hobbled behind my sister to my truck (which she now drives because I can’t) to let the physical healing begin! 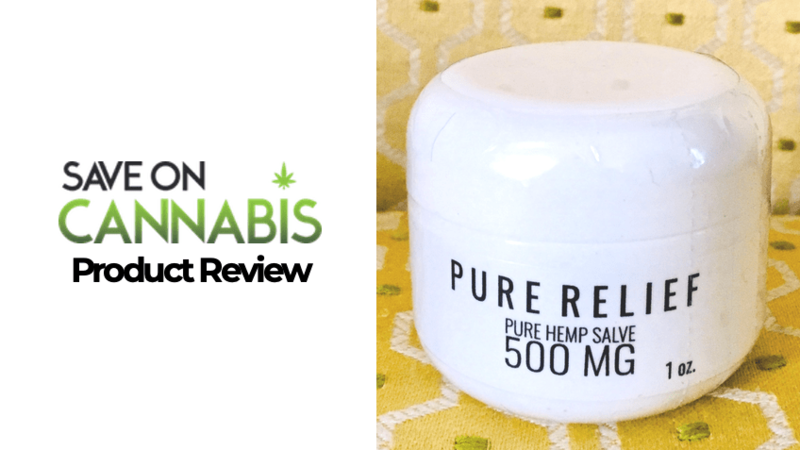 Pure Relief’s Pure Hemp Salve is another wonderful CBD topical to add to my collection! This salve went on smooth and smelled strongly of peppermint. I love smelling like candy all day! It’s much better than smelling like medicine or hemp. The balm was lovely, providing a mild warming sensation which helped take the edge off. My car ride and physical therapy session were made more bearable by the salve. This product will definitely be in the recycling bin by the week’s end, meaning I’m going to use it all up by then. 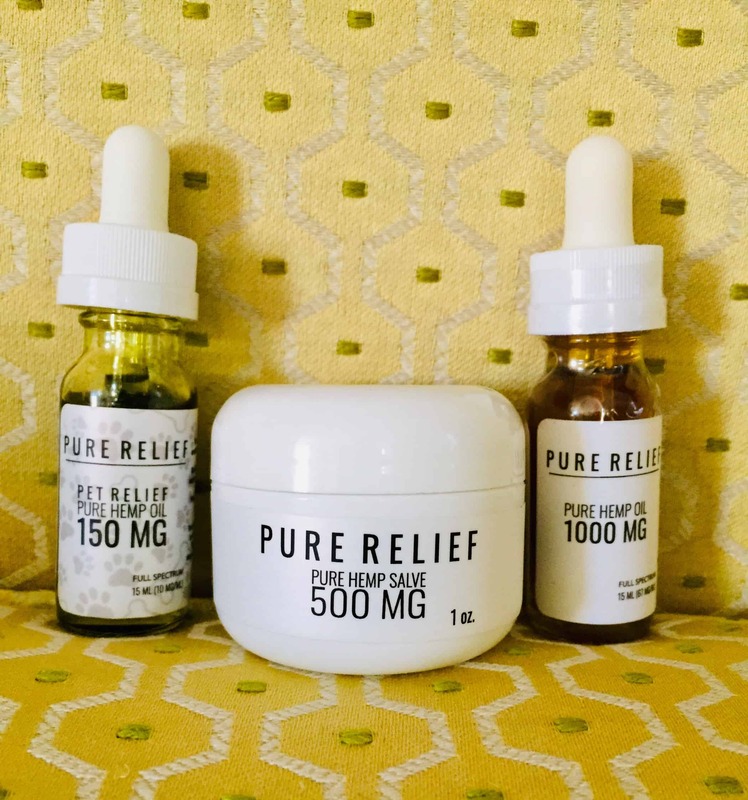 There are so many ingredients in Pure Relief’s CBD-infused salve that offer tried and true medical benefits. Arnica, for instance, is used in homeopathic medicine and was even recommended by my doctor for my post-surgical complications. 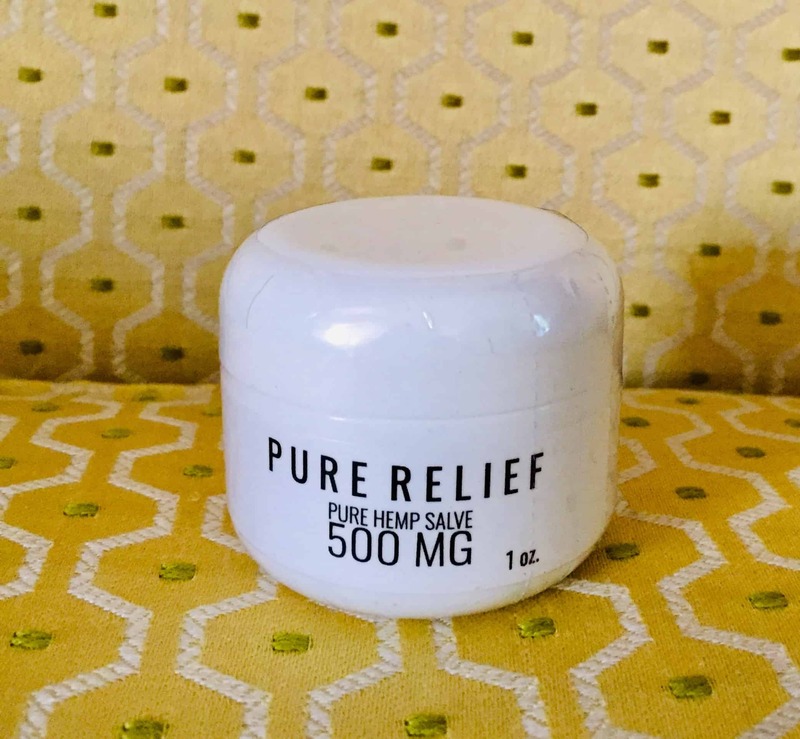 By adding this ingredient to their CBD salve, Pure Relief has set itself apart from other topicals. In the next section, the product is judged on scoring 0-100. Wonderful for massage and smells delightful. The cost is on the higher end of CBD topicals. I’ve tried a few different CBD-infused topicals that have been excellent. 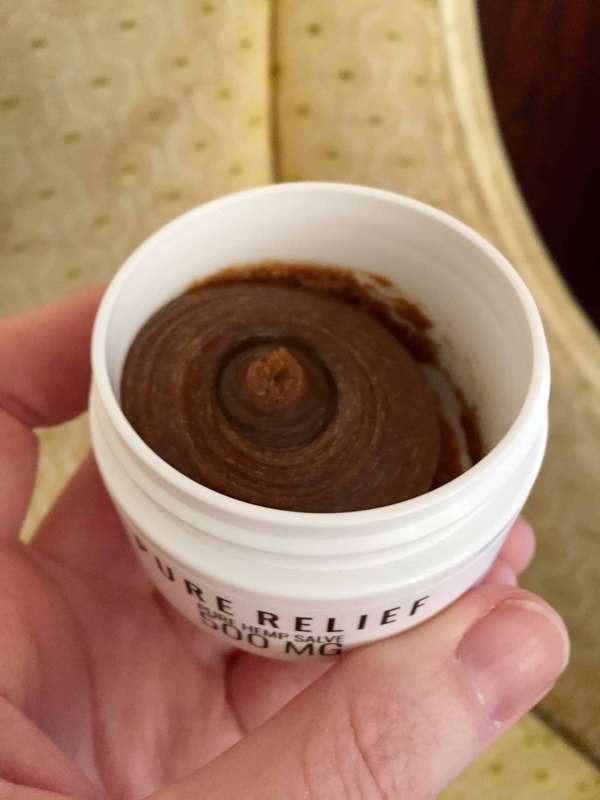 Pure Relief’s salve is no exception. The cooling sensation is a less intense version of Icy Hot. In my experience using other CBD topicals, I’d compare it most closely to Green Roads Muscle & Joint Relief Cream. I just ran out of the Green Roads Cream so this is the perfect replacement. It’s truly hard to pick a favorite. I might need to do a “best of” someday. Save money with CBD Topicals coupon codes here at Save On Cannabis the World’s largest online cannabis coupon code directory.